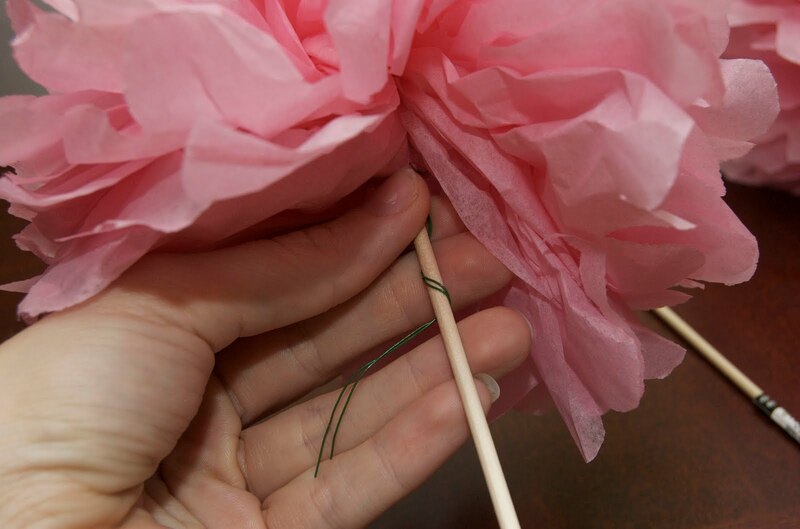 And now for the wildly anticipated conclusion of how to make a tissue pouf ball/pom pom arrangement! Now that you have your three pouf balls made, you’re going to figure what the heck you did with dowel rods/shiskabob skewers while you were playing with all that tissue paper. Gently look through the flower petals until you find the floral wire. Place the top of the dowel rod as far to the center of the flower as you can and tightly wrap the floral wire around the dowel. These will be pretty secure, but a hard tug will pop them off the top. So look, don’t touch once they are done, and remind any little hands around the house to do the same! 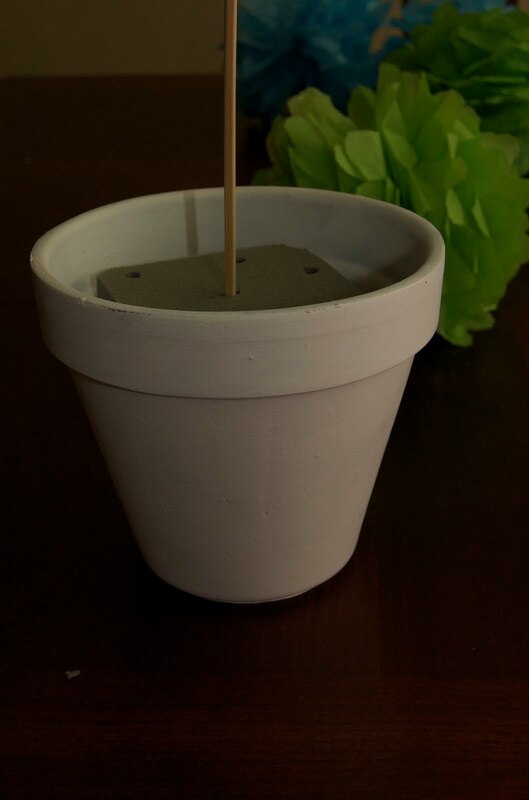 In whatever container you choose – I used a painted flower pot – tightly wedge in a piece of floral foam. If your container is light, place some weights in the bottoms for stability. I placed the tissue poufs on their stems into the floral foam at different heights for a little drama. For a super quick finish, I added a pink satin ribbon and a sparkly antique earring to the pot, and dropped some pink shredded paper on the top. I imagine you could embellish these to be quite elegant or super fun with a little effort! And there you have it. 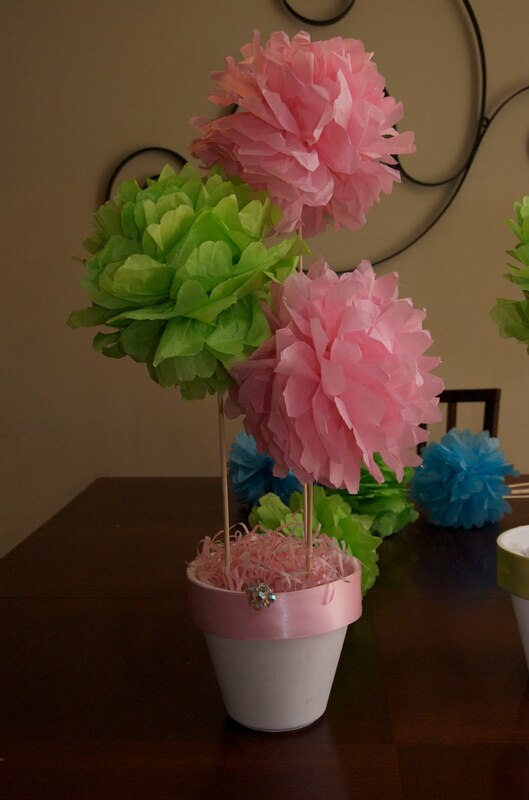 Easy, inexpensive, yet high impact party decor! Fabulous idea and tutorial! Shared on our Facebook wall today. Thank you for such wonderful inspiration! 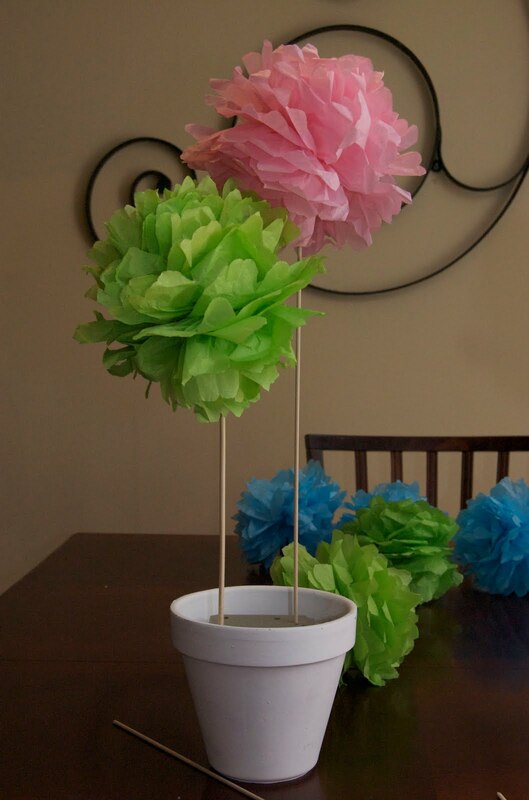 I love these pom poms and want to make them for my granddaughters birthday party but cannot find part 1 of the tutorial! Please help. Thanks. ut only have part 2. Where can I find part 1?? I noticed the pom ball you did for the paisley party. It was sitting in a glass vase. It looks different! Is this because you did not scallop the edges and used more tissue paper. What did you attach to it to set it into the glass vase, or was it just setting on top. I am thinking of making them with gold and black combination for a Hollywood movie costume theme party for this Halloween! I thought they would look elegant as some table settings! Please let me know if you did them differently than the pom poms you showed on your tutorial.